Ruche's 20% off Black Friday Sale extended through 11/30! I've decided to extend the 20% off sale until 11/30 for anyone who missed out! HAPPY HOLIDAYS! Don't forget to take advantage of Ruche's Black Friday and Cyber Monday Sale! For those of you that don't know, The Supermelon is a awesome fashion, trend, and life style online publication. For the past year, they have been interviewing real life women fashion icons from around the world. 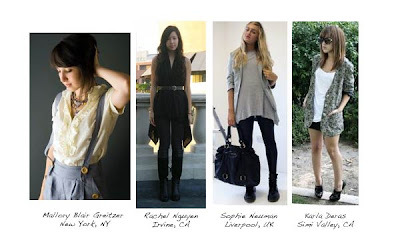 Actually, I have found a lot of my fashion inspirations from these ladies. They are going to crown the best 2008 Real Style lady mid next month. Ruche is sponsoring Supermelon's 2008 Best Real Style Contest! The winners of the contest will get $50 Gift cards from Ruche as well as some awesome stuff from Diesel’s super hip younger line 55DSL. Click here to vote for your favorite! 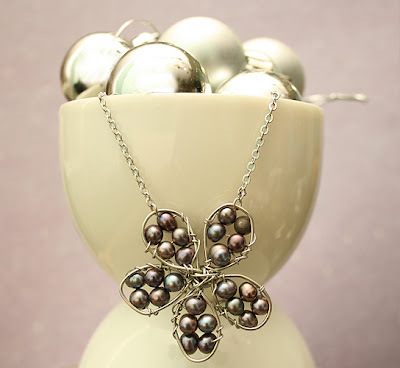 I have a bunch of new jewelry that I'll be adding to the store on Dec 1st. This weekend I was trying to take pictures of everything. This time I experimented with teacups. 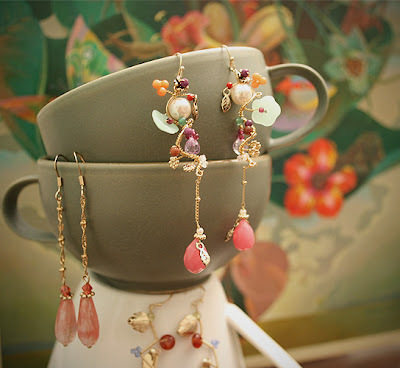 You will see a lot of my new jewelry photos taken with teacups. Teacups stacked on top of each other, teacups upside down, on the side...I tried everything. I do wished I had more varieties of tea cups though! I might have run down to the antique shop for some pretty china the next time around. Here is a sneak peak. I think my favorite is either the first or second one. Ruche is having a HUGE Black Friday SALE - 20% off Entire Store on 11/28! Cyber Monday will be 15% off entire store (12/1)! This is HUGE because you already know how affordable Ruche already is. International orders are welcomed! Please help me spread the word to your friends or on your blogs if you have one! Thanks a bunch ladies! -Gift Certificates are now available! -New items will be added Dec 1st. -Ruche will also be spending time with family and going Black Friday shopping as well. All orders placed between 11/26-30 will be shipped out Dec 2nd. -Ruche will be in NYC Dec 3-7th. All orders made between then will be shipped out Dec 9th. Sorry in advance for the delay! I am putting this dress on sale for a limited time because I think it is just the most PERFECT dress to wear on Thanksgivings! Just look at the colors! The best thing is that you can get it for only $26.99. Please make your purchases by EOD Friday so I can get it to you on time for Thanksgivings! Sorry International ladies, I can only deliver on time within the US. Ruche Visits NY in 13 days!! I live in sunny Southern California where the sun shines pretty much all year round. I have trench coats, thick scarves, and fuzzy warm boots that have been dying to get worn. California rarely gets cold enough! But.... in 13 days, Josh (hubby) and I are heading to New York City for a short 4 day trip! This is our first time to NYC and I haven't been this excited over a vacation in so long. I am currently planning my trip, looking for must see places and must eat at restaurants. If you have any suggestions, please let me know! I am also working on my outfits to bring with me. Ruche needs to go to NY in style! I'll be dressing up Josh as well haha. Hopefully I can post up pictures of my outfits each day. But somehow, I'm guessing I'll be covered up in a trench coat. Is it too cold to wear skirts with thick sweater leggings? I will definitely be taking these things with me! OR you could wait for the friends and family sale on Nov 13-16. Gap is giving 30% off during our best-ever friends and family event. Gap is calling it Give & Get, because for every purchase you make, the Gap will give 5% of the amount you spend to Boys & Girls Clubs of America. Includes Outlets!" Here are some cute things I found on sale with sizes left. You can definitely create some vintage inspired looks with these pieces! I got a pair of these. 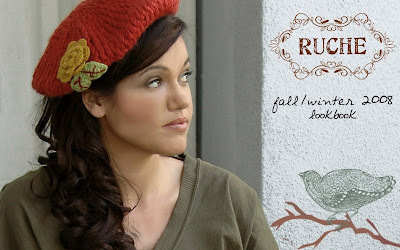 I am so happy to announce that Ruche's Fall/Winter 2008 Lookbook is finally done! After weeks of hard work, I have finally gotten it up =). Here are a couple pages from the lookbook. 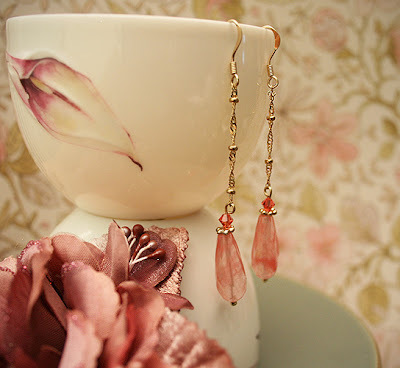 Feel free to visit the boutique to view the rest of the pages. Most the items that are worn by the models have also been added to the site so there are a bunch of new items! Click here to see all our newly added items.